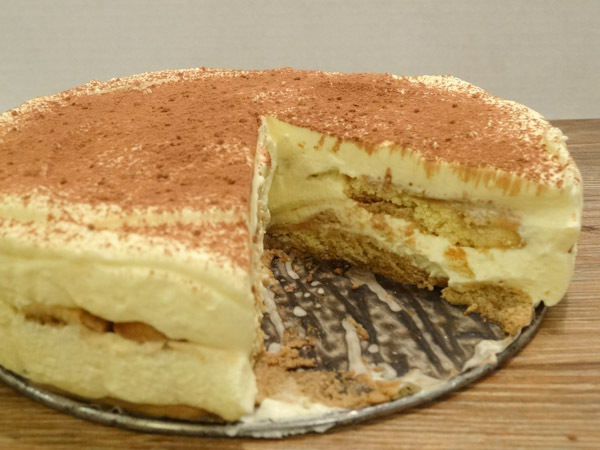 This classic tiramisu recipe contains ladyfingers, coffee, and a delicious mascarpone filling. A light, flavorful tasting dessert. My husband has a coworker that just celebrated working at his company for 30 years. Even though his company does something to recognize the employee, he wanted to do something special as well on the actual day of her anniversary. She requested this tiramisu dessert. 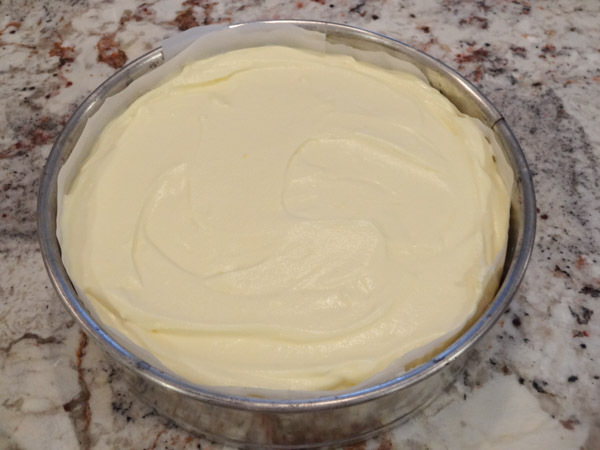 When I made it the first time, I used a 9 x 13 inch pan, but felt like I was really having to scrimp with the filling. I would actually recommend making this dessert in a 9 x 9 inch square pan for best results. I’ve never been a coffee drinker and usually the taste, much less the smell, holds no appeal to me. My grandmother was a good, old-fashioned southern cook and our beverage of choice for lunch and dinner used to be sweet iced tea. When I say sweet, I’m not kidding. That was some sweet tea. I’ve grown out of this habit and now drink mostly water. I never realized tiramisu dessert contained coffee, but surprisingly, I really like this dessert. 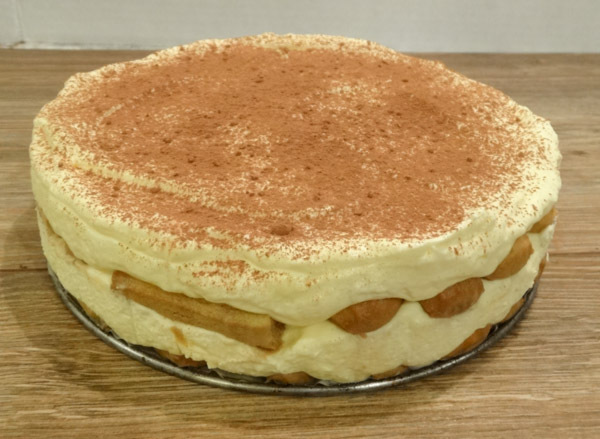 My favorite part of the the tiramisu dessert is the fluffy, sweet pudding like mascarpone filling. Mascarpone cheese is a smooth and creamy soft cheese with a very mild flavor. If you taste test the two cheeses, you’ll find that the substitute version does have a slight twang compared to the mascarpone cheese. Once you add the remaining ingredients for the filling, there is no distinguishable difference in the taste. Brew a cup of strong, dark coffee or espresso. Set aside to cool. Use a double boiler and allow water to reach boiling point first. 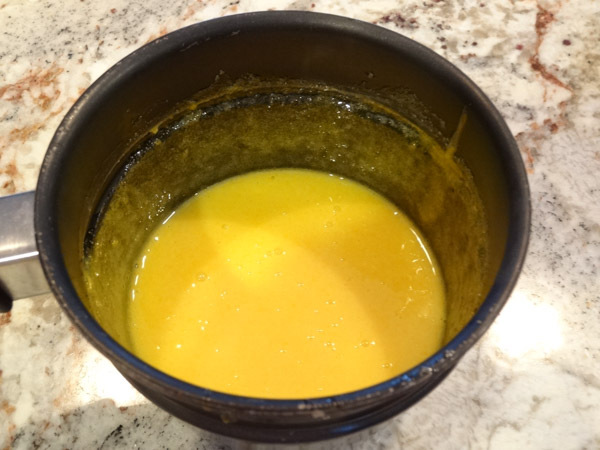 Add egg yolks and granulated sugar to top of double boiler. Heat over low heat, stirring frequently for 10 minutes. Remove from heat and blend with electric mixer for 30 seconds to 1 minute. Add egg mixture to room temperature mascarpone cheese (or use substitute version) and blend until combined with electric mixer on medium speed. In large separate bowl, mix heavy whipping cream together with an electric mixer on medium-high speed for 3 to 5 minutes or until stiff peaks form. 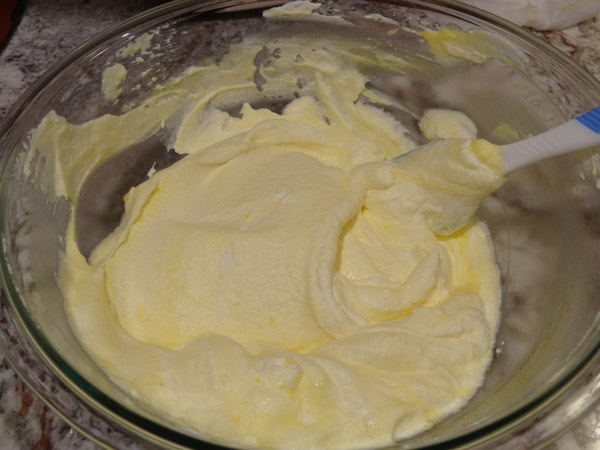 Slowly fold half of whip cream mixture into egg mixture. Finish folding in remaining whip cream. For this recipe, you can add in 2 to 3 tablespoons of coffee liqueur if you like, but this is strictly optional. Since this was made for a work function, I didn’t include liquor in this dessert and the taste of this tiramisu was still absolutely fabulous! Place cooled coffee in a shallow bowl and place a few ladyfingers at a time in the coffee. Let soak for a few seconds only (leave them in too long and they become too soggy) and place in bottom of your pan. I was curious to see how this dessert would look in a cake pan as well. Making this dessert in a circle requires a little more work as you’ll have to cut the ladyfingers to fit into the pan. When all is said and done, I would probably stick with a square pan next time. If you want a strong coffee flavor to your dessert, you can spoon some more coffee over the ladyfingers at this time. (If you’re adding coffee liqueur, I’d spoon it on now as well). Add half of the mascarpone filling over the layer of ladyfingers. Add another layer of coffee soaked ladyfingers on top of mascarpone layer and then finish with mascarpone filling. Cover and refrigerate for at least 4 to 6 hours. Overnight is preferable. Prior to serving, sprinkle the top with cocoa powder. 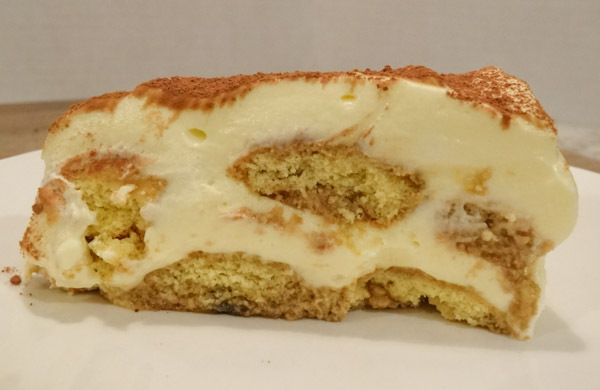 This classic tiramisu recipe contains ladyfingers, coffee, and mascarpone filling. A light and flavorful tasting dessert. Heat egg yolks and granulated sugar in top of double boiler over boiling water on low heat for 10 minutes, stirring frequently. 2. 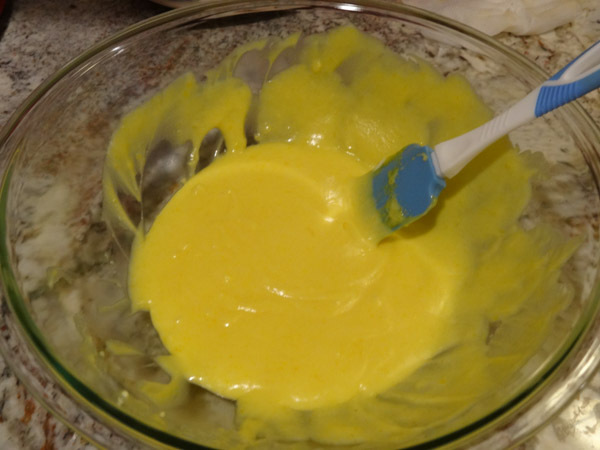 Remove from heat and blend eggs with electric mixer on medium speed for 30 seconds to one minute. 3. Blend egg mixture together with room temperature mascarpone cheese. Set aside. 4. In separate large bowl, blend heavy whipping cream with electric mixer on medium-high speed for 3 – 5 minutes, or until stiff peaks form. 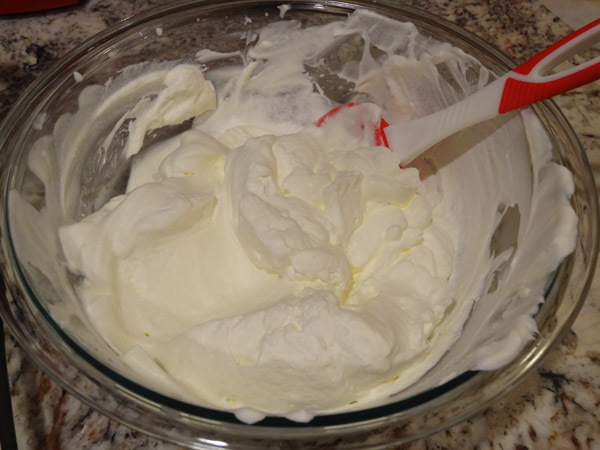 Carefully fold half of whipped cream into egg mixture. Fold remaining whipped cream into egg mixture. 5. Dip ladyfingers into shallow bowl of cooled coffee for 3 to 5 seconds. 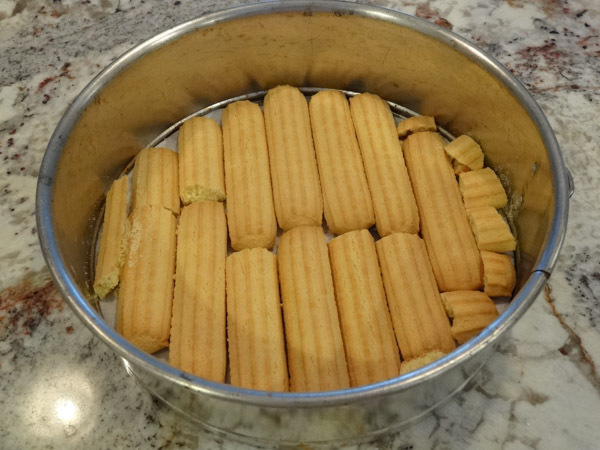 Line ladyfingers into bottom of 9 x 9 inch square pan. Spoon more coffee and optional liqueur onto ladyfingers if desired. 6. 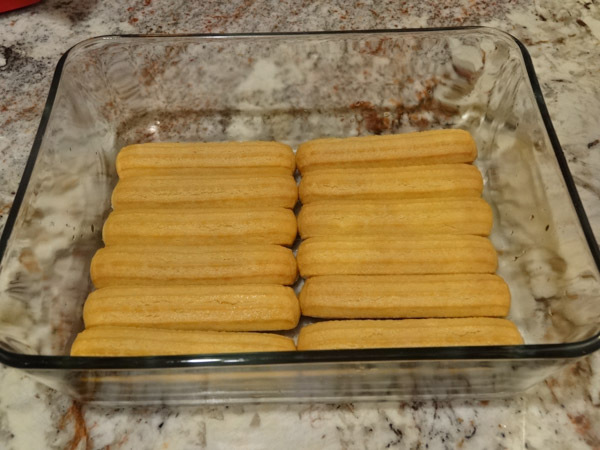 Spoon half of mascarpone filling over row of ladyfingers. 7. Place another row of coffee soaked ladyfingers into pan followed by mascarpone filling. Cover and refrigerate for at least 4 to 6 hours. 8. Sprinkle cocoa powder on top of dessert prior to serving. 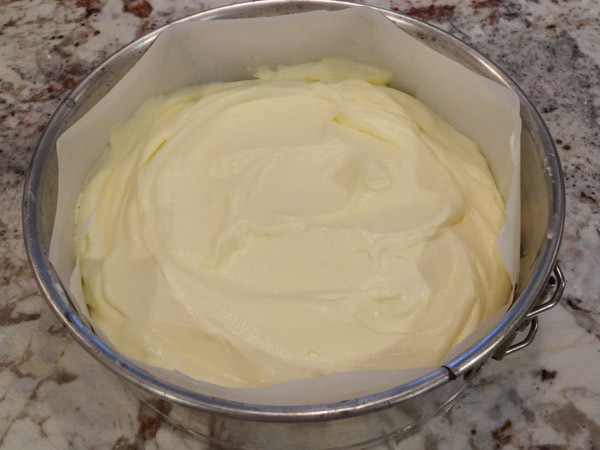 Mascarpone substitute: 8 oz cream cheese, 1/4 cup heavy whipping cream, 1/4 cup butter. Blend room temperature ingredients together with an electric mixer for 2 – 3 minutes or until smooth and creamy. Hi, I'm Becky. This site is dedicated to all dessert lovers. Hope you find something sweet and satisfying to enjoy!